There has been an explosive growth in the number of corporates, investors and financial institutions turning to structured products to achieve cost savings, risk controls and yield enhancements. However, the exact nature, risks and applications of these products and solutions can be complex, and problems arise if the fundamental building blocks and principles are not fully understood. This book explains the most popular products and strategies with a focus on everything beyond vanilla options, dealing with these products in a literate yet accessible manner, giving practical applications and case studies. A special emphasis on how the client uses the products, with interviews and descriptions of real-life deals means that it will be possible to see how the products are applied in day-to-day situations – the theory is translated into practice. UWE WYSTUP is CEO of www.mathfinance.com, a global network of quants specializing in modeling and implementing Foreign Exchange Exotics. He has been working as Financial Engineer, Structurer and Consultant in FX Options Trading Teams of Citibank, UBS, Sal. Oppenheim and Commerzbank since 1992 and became an internationally known FX Options expert in both Academia and Practice. Uwe holds a PhD in mathematical finance from Carnegie Mellon University and has been appointed a professor of Quantitative Finance at HfB-Business School of Finance and Management in Frankfurt, where he is in charge of the Master Program in Quantitative Finance. 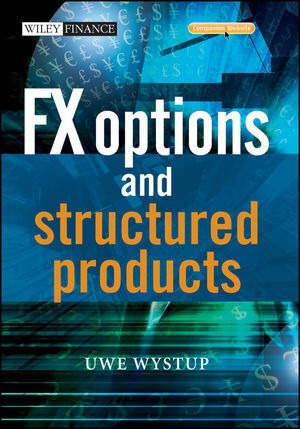 His first book Foreign Exchange Risk co-edited with Jürgen Hakala published in 2002, he has also published articles in Finance and Stochastics, the Journal of Derivatives and The MathFinance Newsletter. 1.1 A Journey through the History Of Options. 1.2 Technical Issues for Vanilla Options. 1.4 Basic Strategies containing Vanilla Options. 2.4 Interest Rate and Cross Currency Swaps. 3.1 The Traders’ Rule of Thumb. 3.4 On the Cost of Delayed Fixing Announcements. 4 Hedge Accounting under IAS 39. 4.3 Evaluation of Financial Instruments. 4.5 Methods for Testing Hedge Effectiveness. 4.6 Testing for Effectiveness - A Case Study of the Forward Plus. 4.8 Relevant Original Sources for Accounting Standards. 5.1 A Tour through the Market. 5.2 Software and System Requirements.